70% Asus STRIX ROG GL553VD laptop review: Game on! Weighing at 2.5 Kg the Asus STRIX ROG GL553VD laptop is not a machine you can lug around every day. Nevertheless, it is a good option for gamers who want portable performance (at times) or want to participate in a gaming night out with friends. Yes, there are a few drawbacks to the machine like the battery life and an unpredictable trackpad; but, these are not deal breakers. What can play a spoil sport is its price. At Rs 1,36,990 the Asus STRIX ROG GL553VD gaming laptop has stiff competition from MSI, Acer and Dell. The $1,099 Asus ROG Strix GL553 is the most affordable gaming laptop that the company currently sells, and it comes with a comfortable keyboard, a vivid display and an Nvidia GTX 1050 GPU. But the laptop's subpar speakers and finicky touchpad are serious trade-offs. There is no reason to skip ASUS ROG Strix GL553VD if you don’t have all the money in the world to spend, but still want to have decent gaming experience on a laptop. The GTX 1050 card is not really a beast, but can hold proper frame rates if you can skimp on few settings (yet use 1080p resolution). Because of the 15-inch display, this unit is also tad smaller than its bigger brother, so perhaps more suitable for carrying. Just note the battery life on all these models is subpar compared to non-gaming notebooks. Anyway, for its core job – to keep players happy – this ASUS is a right tool! Asus is one of the only companies that sells a whole range of gaming laptops in India, and we've tested several of them over the years. We've seen some practical models and some truly outlandish ones, and what's clear is that Asus knows how to reach different kinds of buyers. I have to admit, this laptop is quite impressive. If you’re looking for a gaming laptop in India, the GL553VE at Rs 1,36,990 is an excellent choice. This laptop is for gamers who care about their gaming experience. ASUS ROG Strix GL553VE is a newcomer to the Republic of Gamers family and it doesn’t seem to be a useless addition at all. The Asus does its main job, which is to keep players happy, well: you can throw all kinds of games at this rig without worries of low frame rates – especially if you need not maximum settings on every single one of them. Other components are in check too since there is a new 7th Gen Core i7 powering the system and SSD serving your files fast. The only blunder, which is common in all gaming systems, is poor battery life. If you don’t care about that there are no real drawbacks. So choose this ASUS ROG as your new laptop, that is my advice! Positive: Nice design; good display; powerful hardware; high performance. Negative: Uncomfortable keyboard. 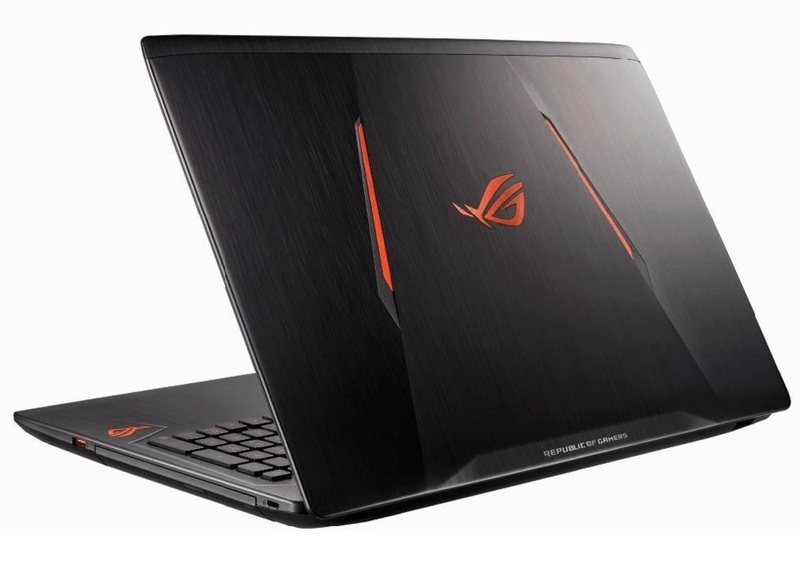 Review Asus ROG Strix GL553VE – Upgrade Nilai Jual Untuk Perbaikan Brand Image? Positive: Backlit keyboard; nice performance; good price. Ревю на ASUS ROG GL553VE – допълнителните функционалности оправдават ли по-високата цена? Positive: Comfortable keyboard; good cooling system; nice display. Negative: Mediocre design. Mid-range gaming laptops, which are affordable, reliable, yet still powerful, meet the essential requirements of users like gamers. Actually, the manufacturer Asus did very well with the combination of an Nvidia Pascal graphics and a 7th generation Intel Kaby Lake processor in the 15.6 inch ROG Strix GL553VD. As a result, the Asus ROG Strix GL553VD could appeal to most users at first glance with not only excellent performance but also great design. Its price can still be considered pretty low in view of its features. “In other words, the Strix seems like it should be a killer deal” (quoted from page DigitalTrends). The Asus ROG Strix GL553VD laptop comes with a 15.6-inch Full HD screen which 178 degree viewing angles and matte finish. GadgetShow comments that this enables users to share the screen with fellows without ambient light distraction. “When you first behold the Strix, named after a genus of predatory owls, you’ll notice that it’s a little less flashy than its predecessor”, said DigitalTrends. Regarding page LaptopMag, between its black-plastic chassis and bright-orange accents, Asus’ laptop looks like it’s ready for Halloween. The lid features two traffic-cone-orange stripes flanking the ROG logo, which is a bit extreme for that reviewer’s taste. The page PCVerge also showed a viewpoint that the Asus ROG Strix GL553VD is - at least by gaming standards - not large and bulky like predecessors. Particularly, at 0.8 x 15.1 x 10 inch (HWD) (2.03 x 38.35 x 25.4 cm) and 5.5 pounds (2.49 kg), it won’t take the least of desk space and is somewhat travel friendly as it can slide into a 18.4” laptop backpack though it is not as heavy as we might expect. The page Geeks3D gave their opinion about the ROG Strix GL553VD’s design: “If you need a 15-inch gaming notebook with a reasonable price and a nice design (black brushed aluminum case), the ROG Strix GL553 is a good choice”. The 15.6-inch, 1080p screen of the Strix is sharp and colorful. The reviewer of page LaptopMag said when he watched a Full-HD trailer for Spiderman, “Homecoming, the red in Spidey’s suit was the perfect shade of crimson and the blue was nice and deep, while the fur in the villainous Vulture’s collar was nice and sharp”. TechForPennies says, “The 15.6” matte display on Asus ROG Strix GL553VD has neat features. It of course supports 1080p resolution and using that with the GTX card won’t be a problem at all. Its technique is similar to IPS, with 180 degree viewing angles at all”. The colors are rich and vibrant, darks are deep and inky. As remarked positively from the DigitalTrends, running through some high-resolution black-and-white photos, the Strix’s display rendered them perfectly, with an appreciate contrast between the brightest whites and the darkest darks. According to PCVerge, the panel is very bright up to 349 nits in the center, and the average luminance of the Asus GL753 is not much lower at 337 nits and Nvidias’s G-Sync Technology isn’t supported here. According to LaptopMag, the colors are vibrant, but they aren’t necessarily accurate: “The Strix has a Delta-E color accuracy score of 1.6 (0 is best)”. The keyboard of the Strix is extremely comfortable. “Thanks to its deep 2 millimeters of travel and 62 grams required force to depress the key, I never found myself bottoming out on the keyboard deck” (LaptopMag reviewed). PCVerge also reviewed that users had a chiclet style keyboard with a numeric keypad, which offers some decent key travel, at least for gaming standards. Evaluated from page DigitalTrends, “The Strix benefits from the trend that the manufacturers have been putting a little extra effort into the keyboards, providing a keyboard with excellent key travel, and a surprisingly high-quality feel”. It has little give, as most laptop keyboards do, but the keys themselves are responsive, clicky and satisfying the touch. The reviewer of page TechForPennies wrote that this notebook came with a backlit keyboard and you could change its color. The overly fussy touchpad in 4.1 x 2 inch (0.41 x 5.08 cm) might make us want to use a gaming mouse when browsing the web. According to LaptopMag, it’s fine for navigating and performing Window 10 gestures, but it only let the reviewer right click in the very-bottom-right corner of the touchpad, while it usually would let him left click just about everywhere. However, the GadgetShow gave a perspective that though the trackpad is large, it is slightly erratic to work with: “Users get all the usual function keys (doubling up as themultimedia keys) with a dedicated ROG app and power buttons as part of the keyboard. This was accidently pressed since usually the delete key is placed at that position on most keyboards”. Followed a comment of DigitalTrends, the Strix GL553VD’s trackpad feels great: “It’s slick, with a matte texture that is pleasant to the touch. It’s surprisingly accurate, sharp enough to use in games like Civilization VI, or other turn-based games that don’t require the precision and speed an external mouse provides”. On the contrary, page Geeks3D complained: “The touchpad is not good especially the left click. I don’t know if this is only on my sample but I don’t like this touchpad”. For audio issues, regarding LaptopMag, the speakers in the Strix are serviceable, but the sound quality isn’t up to par. “When I listened to Blink-182’s “Wishing Well”, the sound filled our lab, but the only parts I could make out clearly were the vocals and guitars”, said LaptopMag’s reviewer. Notwithstanding, “Moving on, the Strix is outfitted with a set of speakers that can produce rich, deep sounds a step above what you might be used to on a gaming laptop. The Strix, by comparison, reproduces rich and lifelike sound without any noticeable clipping” (DigitalTrends). rmed with a 2.8 GHz 7th generation Intel Core i7-7700HQ CPU, 16 GB of RAM, and a 1 TB 7200 rpm HDD, the Asus ROG Strix GL553VD is a fine multitasking machine. The reviewer of page LaptopMag stated that he had 28 tabs opened in Google Chrome, two of which were streaming games from Twitch at high resolution, and he saw only the faintest hint of lag when switching among websites. DigitalTrends says that when it comes to processor speed, the Strix manages to keep up with the competition, but never quite pushes past similarly outfitted competitors. According to TechForPennies, “The Intel Core i7-7700HQ runs on nothing less than four cores, and the clock speed is 2.8GHz. The speed will even increase higher thanks to the 3.8GHz turbo boost feature, so that there are no software I can think of that wouldn’t run on this rig”. Specifically, LaptopMag also left a comment: “You are not going to play games at their highest settings on the Strix, but it’s the NVIDIA GeForce GTX 1050 GPU with 4GB of VRAM will handle most titles on normal or medium settings”. Despite belonging to the new GTX 1000 Series, the GeForce GTX 1050 (4 GB GDDR5) is still a budget graphics card. From the TechForPennies’ point of view, it is going to run any game there currently are, yet we might not be able to use all-ultra-settings on each game. For example, on high presets and 1080p, we can expect The Witcher 3 have 50 fps, GTA5 70 fps and Battlefield 4 100 fps. As a small verdict for its performance, DigitalTrends concluded: “GL553VD is still a budget gaming notebook, but with those specs it should be able to hold its own against competitor and offer decent frame rates at high settings. The GTX 1050 is a card that will likely start to show its age very quickly. It already has trouble running recent games at high and ultra-high setting in 1080p”. The Asus Strix GL553VD, as evaluated from LaptopMag, stayed cool under pressure: “After we streamed HD video from YouTube for 15 minutes, the bottom of the laptop reached 93 degrees Fahrenheit (33,89 °C), and both the center of the keyboard and the touchpad reached 88 degrees (31.11 °C), all of which are below our 95 degree (35 °C) comfort threshold. However, after I played Grant Theft Auto V, the system got a tad hotter. Keyboard and touchpad reached 93 degrees (31.11 °C) degrees and the bottom of the notebook hit a toasty 109 degrees”. And for page DigitalTrends, while performing their gaming benchmarks, they noticed another peculiar issue. The Strix has a bad habit of accumulating an enormous amount of heat. LaptopMag advised us to bring a power adapter with us in case we want to take the Strix anywhere: The Strix GL553VD lasted only 3 hours and 41 minutes on the LaptopMag Battery Test, which consists of continuous web browsing over Wi-Fi. This battery life is notably lacking due to the undersized 48 Wh battery it’s equipped with. In the tests of DigitalTrends about battery, the Strix’s battery barely broke two hours of battery life on a full charge. Pricey budget gamer. Budget gaming notebooks are becoming increasingly popular thanks to GPUs like the Nvidia GeForce GTX 1050, and Asus has decided to throw their hat into the budget ring with the GL553VD. The notebook packs modest hardware into a well-built chassis with some nice extras, but are these factors worth the additional cost? The Asus RoG Strix GL553VD is a competent 15.6-inch gaming platform. It has just enough power to play the latest games at 1080p, all the while running quietly and looking good in the process. It has other notable upsides as well, such as decent speakers and respectable battery life for a gaming notebook. ASUS ROG Strix GL553VE review – do the extra features justify the higher price? Let us put it this way, if you have the extra cash, we strongly recommend going for the ASUS ROG GL553VE instead of the recently reviewed Lenovo Legion Y520 or Acer Aspire VX 15 (VX5-591G). We still have to do a review of the GTX 1050 Ti version of the VX 15 to be fair, but our opinion of the Legion Y520 remains – it’s still the best one considering the value. However, the GL553VE excels with a crisp IPS panel, far superior to the one we’ve tested on the Legion Y520 and offers a customizable RGB keyboard with overall better feel and comfort and more importantly – far better cooling solution. Contrary to the majority of the ROG family, the ROG STRIX is a more subdued design and barring its glowing ROG logo, its more conventional in terms of design and physical attributes. Build quality is passable as average but we do note ASUS’ distinct detailing on the tooling, rubber feet and other particulars which allow them to distinguish this model than the mainstream line. Positive: Large screen; good hardware; high performance; good price. Positive: Large screen; decent hardware; nice performance; good price. Positive: Nice design; low price; decent hardware; nice performance. Positive: Beautiful design; excellent display; good connectivity; comfortable keyboard; low price; nice performance; good cooling system. Negative: Mediocre speakers; short battery life; noisy under loads. ASUS ROG Strix GL553VD Review – Best $1000 Gaming Laptop? Considering new releases like Acer’s Predator Helios 300 at about the same profile and near-identical specs (even the i7 variant goes for around 69k nowadays) but with better performance, it’d make you think a lot. However, this is ASUS that we’re talking about. Tried and tested local after sales have proven why they have always done a podium finish. Positive: Good price; powerful hardware; high gaming performance. Negative: Weak GPU. Positive: Large screen; powerful hardware. Negative: Poor display; low autonomy. Positive: Excellent display; good cooling system; decent hardware. Negative: Overheats while using; uncomfortable keyboard. Positive: Nice display; powerful hardware; high gaming performance; support USB-C. Positive: Large screen; backlit keys; powerful hardware. Negative: No IPS technology; low autonomy. Positive: Large screen; powerful hardware; fast system; high portability; good price. Positive: Stylish design; powerful hardware; metal case; backlit keys. Of the three big-brand, sub-£1000 Trusted has tested, the Asus ROG STRIX GL553 is the most well-rounded. Its biggest shortcoming is battery life, and even then it’s not a complete lost cause in the portability department. The cheapest Dell Inspiron 15 Gaming, which features a near-identical specification, has a much poorer screen, and the same is true of the Acer Aspire VX 15. At this price, the Asus is the best buy. Positive: Nice keyboard; premium design; good cooling system; light weight. Negative: Mediocre touchpad; average speakers. Positive: Good price; large screen; powerful processor; decent hardware. Negative: Low autonomy; no IPS technology. Positive: Good hardware; good price; high mobility. NVIDIA GeForce GTX 1050 (Laptop): Mainstream graphics card based on Nvidia's Pascal architecture and successor to the GeForce GTX 960M. Is manufactured in a 14nm process at Samsung and the technical specifications are very similar to the desktop version.NVIDIA GeForce GTX 1050 Ti (Laptop): Mainstream graphics card based on Nvidia's Pascal architecture and successor to the GeForce GTX 965M. Is manufactured in a 14nm process at Samsung and the technical specifications are very similar to the desktop version.NVIDIA GeForce GTX 960M: Upper mid-range graphics card of the GeForce GTX 900M series.» Further information can be found in our Comparison of Mobile Graphics Cards and the corresponding Benchmark List.